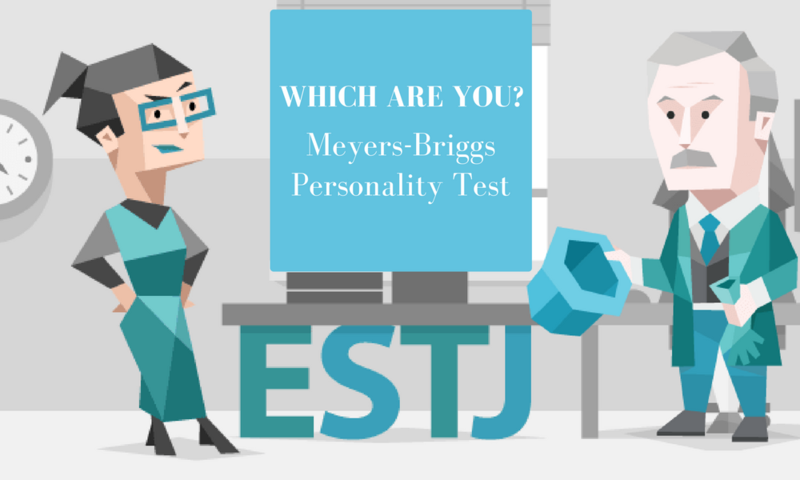 Personality Test: Myers-Briggs ESTJ "The Executive"
After months of friends hounding me to take the Myers Briggs personality test I finally caved in and did, and learned a ton from it. The reason why I never take these things along with reading horoscopes, star signs or listening to physics is because whatever they tell you is usually bs that applies to everyone. But the real reason why I never take these things is because I don't want what they say influencing who I am or telling me what I can or cannot do. Another reason why a lot of tests don't work is because they force answers to questions that are complicated and situation dependent, which means, if the answer you are forced to choose isn't necessarily the way you feel. 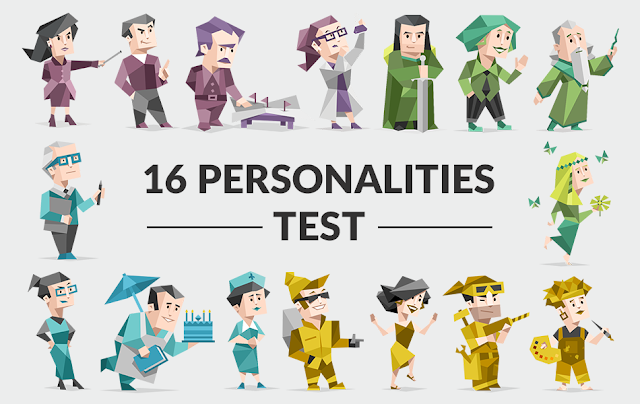 But going through the 16 Personalities test, it was actually really well made, and there were less than a few vague answers that I didn't feel strongly about one way of another. In this post I'm going to share the test with you, analyze the results, and share what I've learned from it. Before we start breaking down mine and how it's helped and hurt my business and personal lives, I want you to take your test and have your answer written down. The trick to taking the test is to read the questions carefully but don't over think them, and definitely don't alter or change them based on who you think you want to be, what the correct answer should be, and what would be politically correct or not. The point of the Meyer Briggs test isn't to impress anyone, it's to figure out how you feel now and if it's not who you think you are or aspire to be, it's a great way to retest in the future and shift your thinking into a new personality type. 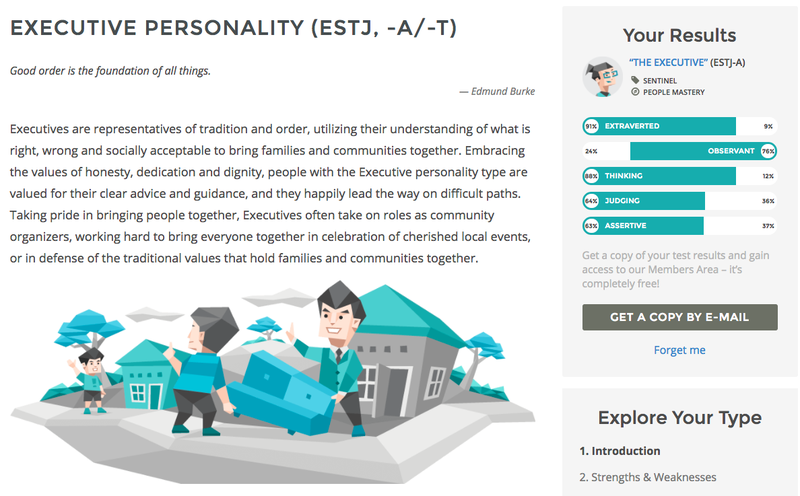 If you've taken the test recently and know who you are, keep reading, but if it's been over a year or you've never taken it, you can take the test for free at 16 Personalities. It's free, really well made and only takes about 10 minutes. Keep this blog post open so you can come back to it after, but take the test first. When I first heard the 16 different acronyms I thought, this is stupid, who cares? But now that I know, it's actually pretty fun as well as insightful. The funny thing is even before taking the test, all of my closest friends who have already taken the test already guessed correctly my personality type. If all of your friends guessed incorrectly, I would take that as a sign that you aren't living your true self and being authentic with who you are. The thing is, there are benefits of all personality types and the best way we can benefit the world is the do what naturally comes to us best. I'm a true believer in balance in the world and that we need each other to make society and the world a more innovative, kind, and better place, as it takes both kindness and logic, neither neither or. So as much as I can't stand super overly liberal people, I also understand that if everyone in the world wanted to preserve traditional values the world would never progress. Not everyone is meant to be the executive or be the event coordinator, as if everyone wanted to do their own thing, there would be no one to bring together. We need each other's strength to balance out our weaknesses. Here are my breakdown and results. A lot of people don't realize this unless they live in my city, but I spend half of my time organizing events and get togethers instead of actually trying to grow my businesses. I know that in the big picture getting people together will benefit my life as a whole, but at least in the short run, the reason why I do it is because I genuinely enjoy getting people together and doing cool stuff. Here are a few of the events that I'm organizing currently. Nomad Summit - The first two years I did it just to get people together as I wanted a proper stage for successful digital nomads in Chiang Mai to share what they know. 2017 is the first year it's going to be a massive event with people actually flying in for it. Nomad Coffee Club - This is a free weekly event that I put on in Chiang Mai as a way for people to meet each other weekly and learn from each other. We don't even have a website and the talks aren't recorded as I want it to be for people who actually live here. Six Figure Sushi - Another way to get people together are the sushi dinners I put together for people who are making over $100,000 a year online to meet each other. These happen once a month or so depending on who happens to be in town. Scuba Diving Trip - Another way to get out of the city, I'm organizing a small island trip to go to Koh Tao after the new year's to go diving. Coworking Chalet - This one started with just wanting to learn how to ski, but is now a 12 person group where I'm looking for a ski chalet to rent somewhere in Europe, either in Zakopane or Bansko this winter so we can all live together, ski during the day, and cowork in the afternoons. Facebook Groups: I'm also the organizer of a bunch of online communities including the Travel Like a Boss Army, Shopify Digital Nomads, and a few private groups including the ones for Earnest Affiliate members, Invest Like a Boss listeners and the coffee club attendees. 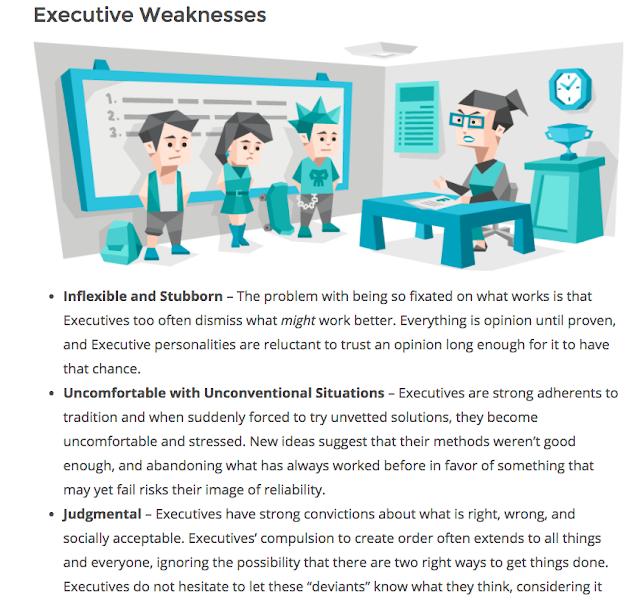 When I first read the personality types of the executive (ESTJ) I thought, wow, this is the best, everyone should be like this. Taking charge, sticking up for what is right, not accepting laziness or stupidity, being direct and honest, dedicated and loyal. But when I read the next section on weaknesses, it all makes sense. The problem with always sticking to what is already logically proven and what already works, is that it's hard to innovate or potentially do things even better. Also by being extremely judgemental and having high standards for what is right and how things should be done, I often forget that there really is more to life and some things just can't be quantified. One good example is the fact that I always want to take take the most efficient route possible, whether it be with business, travel or even when getting to know someone. The problem with that is what I may think of a waste of an hour driving in the wrong direction, which logically it is, can also be seen as an extra hour spent with loved ones and being able to see something new, which it also is. With relationships my biggest downside is that I approach it too logically and don't do the dance, express emotions or feel empathy or sensitivity. I honestly can't imagine dating someone who is exactly the same as me as I'd feel like I'm dating a robot. So even though I may logically think I want to date a completely traditional girl, in reality, my ideal partner is probably someone who balances out my weaknesses with their strengths and vice versa. In this video, my friend Kristen Yates breaks down my personality type and calls me out on my weaknesses as well as explains my strengths. We don't know, what we don't know. I don't think it's a good use of time to spend all day taking quizzes like this instead of taking action. Everything I accomplished above I've done without knowing what my personality type was. You don't need to know what your type is to start taking action, but knowing your strengths and weaknesses can help take you to the next level. Since I took the this test, I've decided on two very important things. The first being that i'm going to allow myself to be the community organizer and spend my time and energy leading the way instead of quietly doing it myself in the corner. It may seem that my biggest accomplishment with dropshipping was making $90,000 this year from my own stores, but in reality, my biggest accomplishment has been guiding 900 people into making a few thousand dollars themselves. I'm sure not everyone made it to the finish line, but it's amazing to know that the ones that did often make more than I do personally. I used to think of it as a weakness that people who started after me now manage bigger stores and sell more product. But after taking the test and knowing what my true strengths are, I now know that my calling in life isn't to continue to be better than everyone else, but instead to get good at something, then help others become great at it. 2. Accept and double down on your strengths. 3. Acknowledge but focus on changing your weaknesses. I hope everyone got a lot out of this post. If you haven't already make sure you take your 16 Personalities test. Let us know in the comments what your strengths and weaknesses are and what you plan on focusing on as well as fixing in the upcoming year. Nice post. Lost of truths here, and a lot to think about (along with in the email you sent linking to the post, too). Glad you liked the post! DId you take the test yet? What's your personality type? seems like you are on the right track, but try not to get too ahead of yourself. It's the people that attend the events that make it a success, so treat those people well with empathy. Do that dance, as you say. Great point, as without people to come to the events I'd just be organizing thin air and myself. Got ISTP, which scored higher among less educated people, even though I have a bachelor's degree. 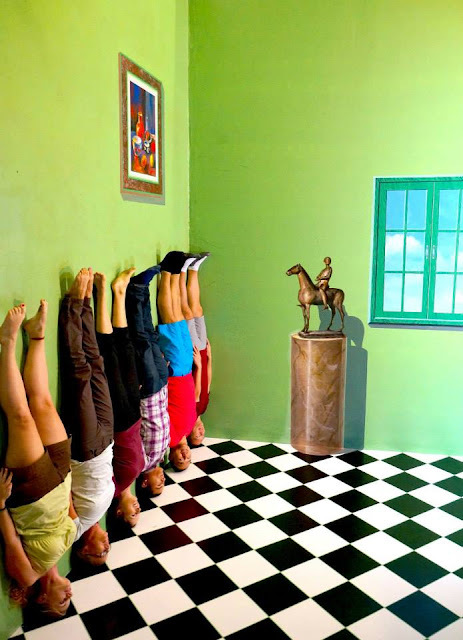 Not sure what that really is all about, but interesting to see and interpret the results.